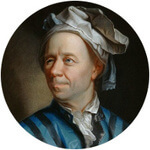 Calculations at a spherical triangle (Euler triangle). The spherical triangle doesn't belong to the Euclidean, but to the spherical geometry. 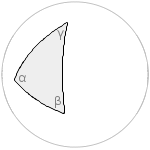 The three sides are parts of great circles, every angle is smaller than 180°. Enter radius and three angles and choose the number of decimal places. Then click Calculate. Please enter angles in degrees, here you can convert angle units. Radius is a one-dimensional unit (e.g. meter), the area has this unit squared (e.g. square meter). The sperical excess is an angle, calculated in degrees.